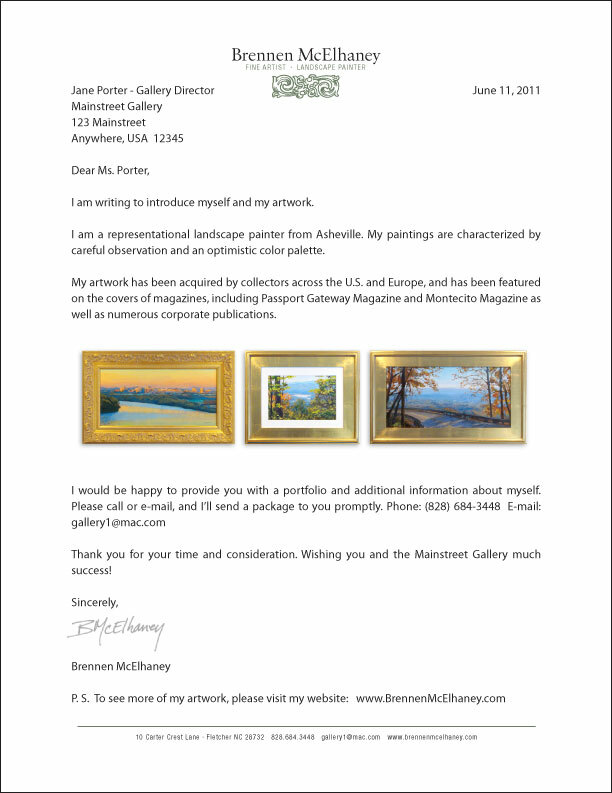 For your consideration: A more efficient alternative to sending your portfolio to prospective galleries. – More bang for your buck. 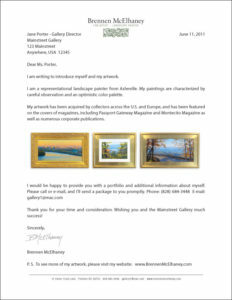 When you’re seeking representation for your art, I recommend sending a letter of introduction with a rack card (9 x 4 in. 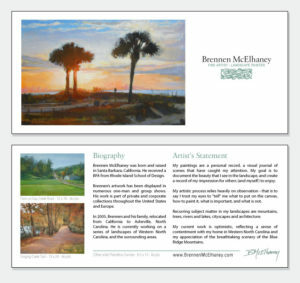 postcard) and a business card, instead of sending a “complete” portfolio package to every single prospective gallery. This is not a “shot-gun” approach, there’s still a lot of research and effort required, but this method will allow you to send out many more prospecting packages with less cost and effort than sending a traditional portfolio package. Do your homework to pre-qualify galleries. I recommend making a list several dozen galleries, that are within a reasonable driving distance, and would consider showing your work. Don’t automatically write off galleries that don’t show exactly your type of artwork. They may be looking for something just like what you do to round out their offering! On the other hand, if your work is completely different than a gallery’s collection (for example, if you do digital photo-collage and they only show dead Russian Impressionists) don’t waste your time or theirs. Add prospective galleries to your mailing list for future show announcements and invitations to your open-studios. (snail-mail list only.) Multiple impressions make a better impact. Address the envelope and the letter to the gallery director, by name. If the gallery director is not listed on their website, call and find out! Include your complete name, contact info and website on your material! Make sure your printed materials are as professional as possible. Artists – What works well for you when looking for gallery representation? Galleries – What do you wish artists would do when introducing themselves and their art? Nice! I do think this is far preferable than the packets these days. But I also think you need to do it multiple times over a period of at least a couple of years. That’s why my suggestion is the postcard campaign. Alyson, Thanks for taking the time to comment. Your insight is always appreciated! And thanks for the reminder of the need for multiple exposures. An introduction letter should be seen as part of a campaign – one step in the process of wooing a gallery, not a one-time-deal. Pam – I am so glad that you found this post helpful and adaptable for your needs to promote your gallery artists. This is a great idea — different, simple and still effective. Thanks for sharing!